The first day of school would start with the teacher leading the students in team building activities and giving them ample opportunities to get to know each other. Kids would be paired and grouped in different ways to make sure that everyone learns everyone else’s name. New kids would be warmly welcomed by returning kids. They would also learn about each other’s talents and interests. This conversation would be ongoing throughout the year to give kids the chance to share with and encourage each other as they learn new things. If school were more like camp, hands-on activities would far outnumber multiple-choice tests. The information that really “sticks” is the stuff we do, so why is so much time spent on memorizing things that are forgotten within days? If school were more like camp, students would spend less time sitting at a desk quietly working by themselves on a work sheet and more time practicing teamwork and collaboration, working on science projects and presentations, acting out a book they are reading, and building their creativity and problem-solving skills. Students would be encouraged to delve deeply into topics that interest them, regardless of what’s on the list of standards. If school were more like camp, teachers would be trained to create a fun, warm, and inviting place as much as they are trained to teach math skills. They would learn how to find what is special and unique about each of their students and help their students feel valued and included. Teachers would check in with each student, every day, asking how they’re doing and providing support if they are struggling. Kids would be excited to get to school, and teachers would greet each student with a smile and a high five, hug, handshake, or fist bump. If school were more like camp, kids would be cheering for and supporting each other as they learn new skills. Kids would celebrate each other’s successes by making daily “WOW” announcements and leaving encouraging notes. For kids who are struggling in some area, supportive peers would provide guidance and encouragement. Kids would openly talk about their areas of strength and weakness and support each other in improving. At camp, we require that kids participate in certain activities, even if they’re a little scared. We know that they benefit immensely from challenging themselves and building new skills. But we also allow kids to pursue activities that they are passionate about. What if school could be the same way? Kids would be required to learn specific skills, of course, just like they are now. But they would also have more free choice options to pursue things they’re passionate about. Aspiring writers could have their own blog. Future doctors could do extra science research and experiments. If we showed more respect for kids’ interests and desires and let them spend more time on things that they are passionate and excited about, school would be a much happier place for them. Summer camps make a point of helping the community to bond quickly through playing games, hiking and camping together (a.k.a. meeting and coming through a challenge together), telling stories around a fire, sharing sleeping quarters, and creating rituals around daily tasks like eating. At summer camp, kids do things they are afraid of. They go swimming in creeks with snakes, they sleep in cabins with creepy crawlies, they go on 3-day hikes and sleep in the woods with who knows what kinds of monsters, they scrape their knees, and they don’t have their parents around to rely on. Now if that isn’t just a recipe for learning coping skills and how to handle the unexpected, I don’t know what is. We already know that sitting in a desk and being lectured at is not the best way to learn. There are also studies showing that environmental education boosts creativity, social skills, and problems solving skills. So it’s clear that education should be more hands-on and more out of doors. Singing a beautiful or lively group song is different than singing along to the radio. It can bring a group together and can infuse a relatively mundane task with humor and joy. But it takes time and commitment to build up a community repertoire of songs. We have to take the time to teach them and sing them regularly so that is an inclusive activity. There is little quite so touching as a group of young people harmonizing around a camp fire, or singing a song of gratitude to the cooks, or merrily caroling as they walk to the next activity. This is something that summer camps get really right and most schools get really wrong. At summer camp, kids are constantly mingling across ages. Teen-age counselors are leading the activities and what could be more hip than that to a 10-year old? Here is this older, totally cool person, who isn’t nearly so old as their parents, who they can jump on, and look up to and learn games from. They get to see this older person making jokes, having conversations, dealing with problems, singing songs, having fun and generally being a model of (more) mature, multi-dimensional life. In schools we separate the teen-agers from the pre-teens and both suffer. The teens lose out on that sense of responsibility and accountability; they don’t get that sense that their behavior might influence someone else. And the young ones only have teachers and parents to look up to, who seem so distant and foreign, instead of learning from a variety of ages and outlooks.
. . . and some others based on my own experiences. Informal drama and theater is also part of the camp experience with talent shows, charades, and paper bag dramatics. There is innate joy to expressing oneself through drama and theater without the fear of being graded or judged harshly. Sitting around passively isn’t part of the camp experience. If the camper isn’t playing a sport, s/he might be going for a swim. Then s/he runs to the art room, and after that – maybe a quick game of tag. Kids aren’t (or shouldn’t) be told not to run (as in run in the halls). Multiple means and avenues are used to learn to swim, tie a knot, identify a leaf, make a lanyard, and/or sing a song, A combination of direct instruction, peer modeling, peer feedback, and natural consequences work together to help insure that most campers learn these skills. Evaluation and assessment are indirect and ongoing – again coming from multiple sources.
. . . and finally, if we are serious about student engagement, motivation, and retention, then student satisfaction with and enjoyment of school should be a primary goal. From the New York Times article, Why Can’t School Be More Like Summer? Summer camps are by design happy places, run by people who clearly have been selected for their genial and outgoing personalities as well as their willingness to be ridiculous and silly on short notice. Camps embrace what Robert Louis Stevenson called “the duty to be happy” Happiness is embedded in the summer camp business plan, and is central to what they do. If children aren’t happy; they won’t come back. 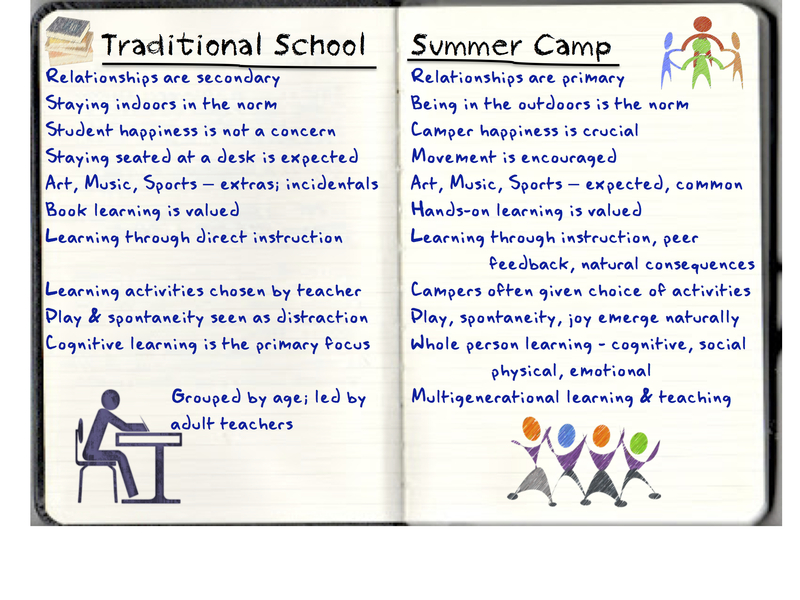 Schools could learn a lot about student retention and achievement by taking a page from the summer camp happiness playbook.This is especially true right now. Yet in all the talk about education reform, happiness rarely seems to make the list, even though there’s plenty of evidence out there about what an improved school environment might mean for learning and test scores, not to mention student attitudes and drop-out rates. The bottom line, which is the focus of many of my blog posts, is that there is a belief that schools need to be the way they are. They do not. I agree wholeheartedly! Especially with the “Positive Culture” aspect. I found summer camp to be much friendlier and more accepting than school. I felt I could be myself much easier at camp.